ACCRA, Ghana (CNS) — A high-level Vatican official who once served as papal nuncio to Ghana returned to mark its 60th anniversary of independence, and once again he represented the pope. Cardinal Giuseppe Bertello, president of the commission governing Vatican City State, served as papal envoy for the early March celebrations that also marked 40 years of diplomatic relations between the Vatican and Ghana. The cardinal, who served as apostolic nuncio to Ghana from 1987 to 1991, presided over the re-consecration of Ghana to the Sacred Heart of Jesus at an ecumenical and interfaith prayer service at Holy Spirit Cathedral March 4. More than a thousand people — including the president of Ghana, the speaker of Parliament, the chief justice, national chief imam, traditional leaders and leaders of other Christian denominations — attended. Cardinal Bertello also presided over a thanksgiving Mass at the cathedral March 5 and joined in the diamond jubilee of Ghana’s independence at a parade at Black Star Square March 6. 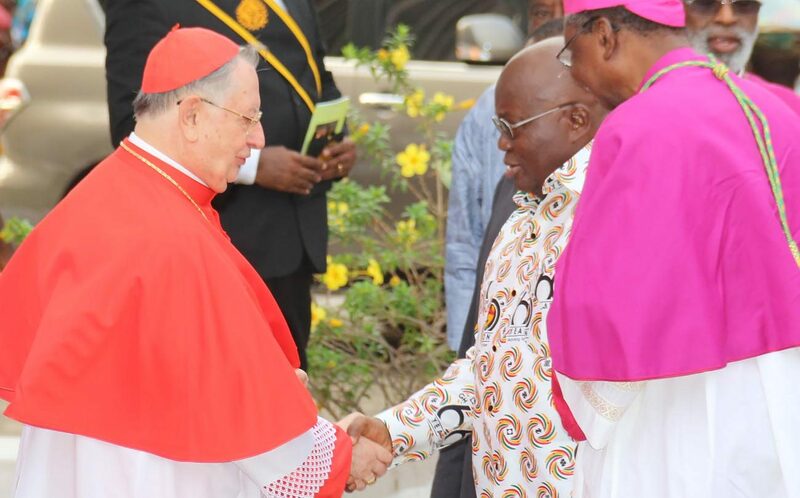 During an event at the apostolic nunciature March 3, Samuel Kofi Dzamesi, minister for chieftaincy and religious affairs, pledged that Ghana would continue to work with the Vatican to benefit all citizens. Dzamesi, who represented President Nana Addo Dankwa Akufo Addo at the reception, said the Catholic Church had committed itself to a lot of humanitarian and other support programs, especially in the sectors of education and health. Dzamesi said the strength of these relations was again demonstrated in the elevation of Ghanaian Cardinal Peter Turkson as a cardinal in 2003 and his appointment to the Pontifical Council for Justice and Peace as the first prefect of the newly created Dicastery for Integral Human Development.